Mythbusters is on the Science Channel right now. It's been on for three straight days. 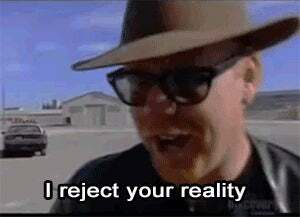 Everything is Mythbusters now. On Christmas Day, I decided to take a nap and it's relaxing to have the TV on. Napping to a TV show you've seen a million times is relaxing and lulling. Top Gear, How It's Made, cartoons... all good. I stumbled upon a Mythbusters marathon. Fabulous. Much wonderful napping was had. Friday, PSN was still down, so I channel surfed a little and found more Mythbusters! Okay, cool. Good background noise. Today, I'm feeling a little under the weather. I figure I'll lay in bed, maybe do some reading, watch some TV. More Mythbusters. It's like Groundhog Day. I don't know what day it is anymore, what hour it is. There is no beginning or end to each episode, they all run together into this big massive show. They have done all the experiments. There is nothing but Mythbusters. There has always been Mythbusters. There has never been anything else except Mytbusters. Everything is Mythbusters. Everything is Mythbusters. EVERYTHING IS MYTHBUSTERS.